If you’re in the market for a new grill I highly recommend finding one with a built in thermometer on the front (usually a little round dial-type works nice — right in front above the handle). You can even buy them for cheap and install them even easier. Usually one little drill hole is all it takes. However, there is a good stand by if you’re roughing it without the thermometer. Need to guess the campfire’s temperature? The answer is in the palm of your hand! Here’s How: Hold your hand – palm side down – about five or six inches above the coals. Just over where the meat will be. How long can you hold it there? Don’t get crazy… but.. in general, the about of time you can stand it will tell the tale. If you can hold out about six seconds you’re probably at a good smoking temperature. 240 Degrees or so. If you can stand the heat on your palm for only three and a half seconds you can call it medium heat. About 375 Degrees. If you’re jumping back at just one or two seconds you’re at HIGH HEAT over 500 degrees. Ever find yourself with company coming over and you need to clean the grill but you’re left with out a grill brush?! 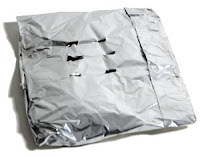 Here’s an easy trick: Grab a wad of all American aluminum foil. It’s the pit master’s duct tape! Crunch it up in a ball and utilize a pair of long handled tongs. Voilà! Instant scrubber. It’s not quite as good as a wire brush but it is more disposable! Follow up the scrub by wiping down the grate with a folded and oil-soaked paper towel to remove any additional residue and to additionally season the grill. Ever try flipping a shrimp on a skewer? Often times it will become a game of spin the prawn. Small, short, and round ingredients often are tough to control on a tiny stick. In fact, I don’t think I’ve ever seen a perfectly toasted marshmallow! First, soak twice the usual amount of bamboo or wood skewers in water (this soak will get them nice and waterlogged and keep them from burning on the grill). Next, simply double thread the ingredients with a PAIR of skewers. The extra stick makes for easy flipping and doubles the odds your perfectly grilled morsels avoiding a drop through the grates! Grill It! 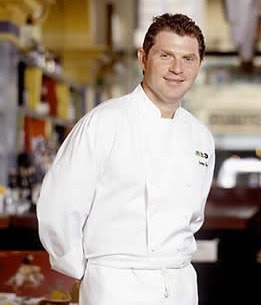 With Bobby Flay Wants YOU! why you’d make a fantastic candidate for GRILL IT! with Bobby Flay! Unlike “Throwdown with Bobby Flay” there’s no winners or losers, instead GRILL IT! shows people how to grill with a well-stocked kitchen. You don’t need a thousand dollar stainless smoker to prepare great BBQ. In fact, you may already have all you need in the kitchen. Even a gas grill can provide a succulent slow smoked flavor to almost any meat. The secret is in the smoke and getting the heat down LOW. Good thing is many of today’s gas grills come with a temperature gauge right on the lid. 225 degrees to 250 degrees should do nicely for most slow smoking. Just give it plenty of time. 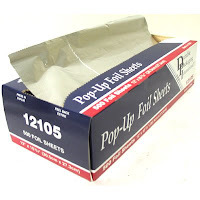 Create an envelope out of heavy duty aluminum foil. It need not be pretty… sometimes I’ll just wrap up the larger chunks of hardwood in a wad. Then, lay the pouch on or near the gas burner (or even on charcoal). Have another pouch handy after an hour or so. 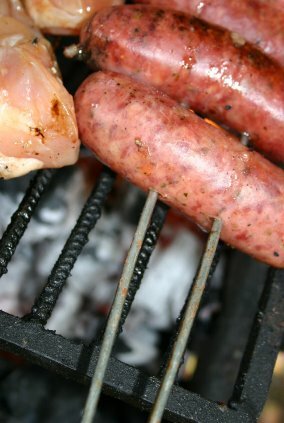 It’s OK to leave the “done” pouch in the grill until after cooking. You’d be surprised how much smoke flavor continues to emit from the pouch even after the visible smoke is gone. This easy extra adds a nice touch to gas grill ‘cue. Clean up is also a breeze.